It’s been eight years since this LA comedy trio came to the Los Angeles entertainment scene with a dose of irreverent, hysterical, and politically incorrect Latino comedy. Like their predecessors from the 80’s Culture Clash, Chico’s Angels serves Latino comedy at its best, with a universal humor appeal, that will make anyone practically pee in their pants. 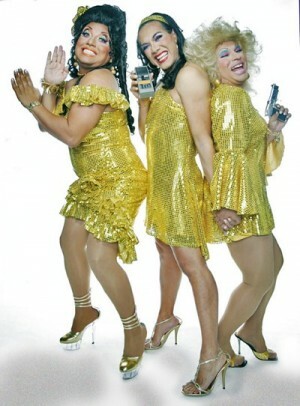 Chico’s Angels is a crazy parody of the 70’s TV hit classic Charlie’s Angels but with three Latino drag queens in stilettos and pretty wacky drag queen makeup, delivering outrageous laughs for days. It’s like nothing you’ve seen before, and since their inception in 2003 at the Cavern Club (Casita Del Campo in Silverlake, CA), these funky gals have developed a cult following, yours truly, being a part of it. What started as an underground, possibly, a hobby-type of commitment, has turned out to be one of LA’s hottest, and most critically acclaimed musical theater reviews in town. 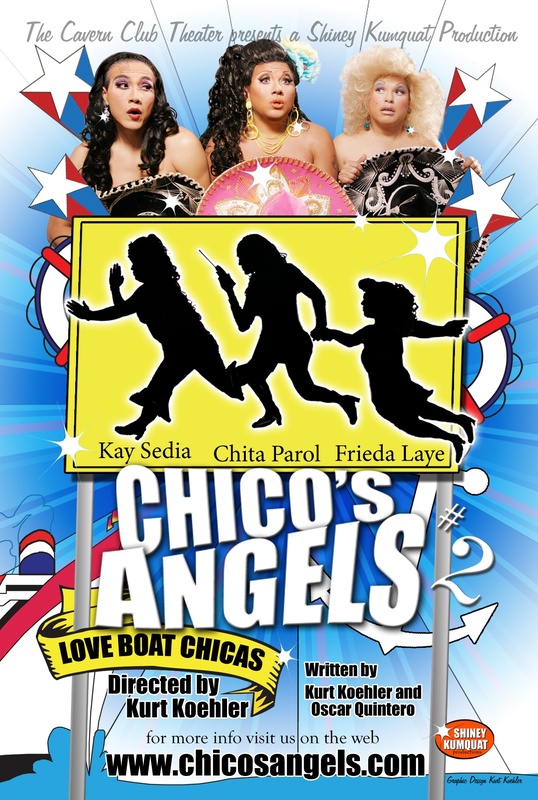 With a web series, and now four sold out musical productions under their belt (Pretty Chicas in a Row, Love Boat Chicas, Chicas in Chains and Chicas are Forever), Chico’s Angels is once again taking their show Love Boat Chicas on the road. Masterfully directed by Kurt Koehler and Oscar Quintero, Chico’s Angels is back with a vengeance to solve crime Latin style, with lots of wacky makeup, stilettos and some crazy lines you will be repeating over and over again. Chico’s Angels’ stellar cast is comprised of Kay Sedia, Frieda Laye, Chita Parol, Bossman, and an equally impressive supporting cast. Love Boat Chicas is a true delight and a true comedic masterpiece; it’s what musical comedy should be all about: stomach-pain, uncontrollable-tears-kind-of-laughing that only this show can guarantee. Why this show has not gone beyond the confines of California is beyond my comprehension. Chico’s Angels is so deliciously wicked, that it truly deserves its own place on or off Broadway very soon. If you like to laugh, and need a delirious escape from today’s cruel reality and tough economic times, Chico’s Angels is by far one of the best ways of numbing oneself from the ugliness of every day life in the big city. Thank you Chicas for creating memorable characters, and for keeping the spirit of the 70’s alive in your parody of one of my childhood’s favorite TV shows, Charly’s Angels, but with a twist of cheese, fabulousness and of course, your unique, spicy Latin flavor. Lethal Fatal with my favorite angels: Chico's Angels!